Quick trivia question: Who was the last quarterback to win a road game in the divisional round of the NFL playoffs? 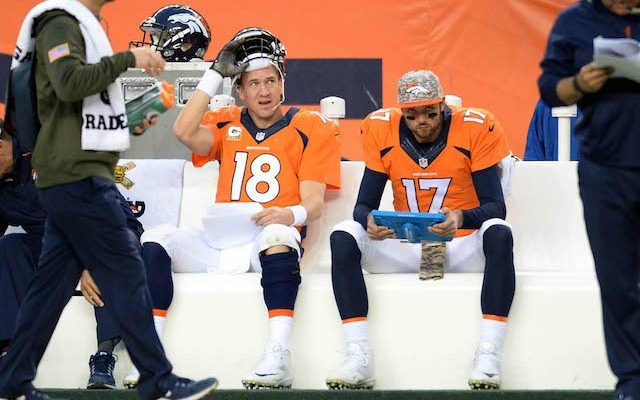 If you guessed Tom Brady, Peyton Manning, or Ben Roethlisberger, you’re wrong (most of their games were at home); if you guessed Aaron Rodgers, Eli Manning, or Joe Flacco, you’re wrong (too long ago); if you guessed Tony Romo, Matt Ryan, or Andy Dalton – well, then there’s no real hope for you. But if you guessed Colin Kaepernick – yes, Colin Kaepernick – you’re correct! That’s right, three years ago, Kaepernick marched into Carolina spoiled Cam Newton’s playoff debut. It was an ugly defensive battle with both the Panthers and 49ers not too far removed from their respective Super Bowl disappointments, and since that game in 2014, nine straight divisional games have been won by the home team. So Lesson #1: Road teams usually don’t win in the divisional round. But wait! There are a few caveats. Newton was playing in his first playoff game; although Newton wasn’t quite a rookie, it’s worth remembering this week that rookie quarterbacks making their playoff debuts are 5-7 overall and 3-4 in the divisional round. That’s not awful, but it’s also worth noting that no rookie quarterback has ever won the Super Bowl. Meanwhile, between 2005-2012, home teams went only 17-15 in the divisional round. So Lesson #2: Don’t count on a rookie, and Lesson #3: Maybe road teams will win again. Hey, no one said these lessons had to be consistent. Oh, and one final lesson: Tom Brady lifetime is 10-2 in the divisional round. Probably not a good idea to bet against him. These two teams played each other Saturday of divisional weekend four years ago (so did the Texans and Patriots) and few remember that if Matt Bryant doesn’t nail a 49-yard field goal at the end of regulation, the Falcons go down as the team with the biggest 4th quarter collapse in playoff history. With just over 13 minutes left, Atlanta enjoyed a 27-7 lead over a rookie quarterback named Russell Wilson. Somehow, the Seahawks scored three touchdowns over the next 12 minutes an were it not for the heroics of Bryant’s leg and Jacquizz Rodgers’ kickoff return, the 2012 NFC Championship – and probably Super Bowl 47 – would look much different. But that was a historically great Seahawks team. The 2016 Seahawks have had as much bad luck as the previous teams have had good/ridiculous luck; injuries to Earl Thomas, Tyler Lockett, C.J. Prosise, and a still-not-fully-recovered Russell Wilson have taken a toll on Seattle’s Super Bowl odds. Sure, they dominated a hapless Detroit team last week, but going across the country for the early Saturday game is definitely not what the Seahawks hoped for. Although they beat the Falcons Week 6, the game was in Seattle, Atlanta dominated most of the game, and the Falcons lost due to one of the worst non-calls in NFL history. Yes, defense wins championships and I don’t believe Atlanta’s 27th-ranked scoring defense (giving up an average of 25.4 points per game) can win the Super Bowl. But bad defenses can win home playoff games, and quietly, the Falcons defense has played better down the stretch. In Weeks 14-16, Atlanta only surrendered an average of 14.3 points per game, and in their finale versus the Saints, they led 38-13 before they pulled their defensive starters in the 4th quarter. Plus, statistically speaking, it’s not Atlanta’s defense that determines the outcome of their games – it’s the offense. The Falcons went 10-0 in games where they scored 31 or more points, and 1-5 in games where they were held under 30 points. They did lose three games at home this year, but one of those games was fluky and another one was an overtime loss to the Los Angeles San Diego Chargers. Atlanta has a top-five passing attack and rushing attack. They led the NFL in fewest giveaways (11), Matt Ryan is the likely NFL MVP, and Vic Beasley is a great choice for the NFL’s Defensive Player of the Year award. There are causes for concern –namely, Matt Ryan’s playoff record (1-4) vs. Russell Wilson’s (8-3 and a Super Bowl ring) – but I give Atlanta the edge in this game. The Seahawks have been iffy on the road all season and should have lost to the Falcons at home. No secondary, including Seattle’s, has definitively proven capable of shutting down the Falcons’ spectacular vertical threat. Atlanta faced a considerably tougher schedule than Seattle, and Russell Wilson has never won an indoor playoff game. There is speculation C.J. Prosise may return to the lineup, but if the Seahawks want a track meet on offense, the Falcons will gladly oblige. Perhaps most importantly, there is always one team that wins impressively during Wild Card weekend and inspires a rash of “oh boy, here they come!”-type overreaction. Think the 2001 Ravens, 2002 Jets, 2005 Patriots, 2009 Cardinals, and my personal favorite, the 2011 Denver Tebows. This Seahawks team is the perfect candidate for 2016’s overreaction team – a formerly great team beating down an undeserving wild card team at home on national TV. It’s the perfect recipe. Playoff Doppelganger: 2011 AFC Divisional Round, New England 45, Denver 10. The Pats’ unworldly offense was too much for the Denver Tebows, who realized the clock had struck midnight right after the previous week’s unforgettable win against the Steelers. And yes, I’m still picking the Falcons even knowing that Tim Tebow and Matt Ryan have the same number playoff wins. Saturday, January 14, 8:15pm EST, CBS. On this week’s edition of the B.S. Report Bill Simmons Podcast, Cousin Sal sarcastically remarked that Bill Belichick should bench Tom Brady this week and instead start Jacoby Brissett. After all, it was Brissett who led the Patriots to a 27-point beatdown of the Texans on September 22 in front of a national TV audience. And as certain recent athletes past their prime have demonstrated, getting some time off before a championship game isn’t necessarily a bad thing. It’s not an all-around horrible idea (though it may lead to some interesting reactions from Brady on the bench). Here’s the interesting thing, though: I don’t think Houston is all that bad. They actually played pretty well last week against a Raiders team (albeit sans Derek Carr) that won 12 games and had a pretty healthy defense. 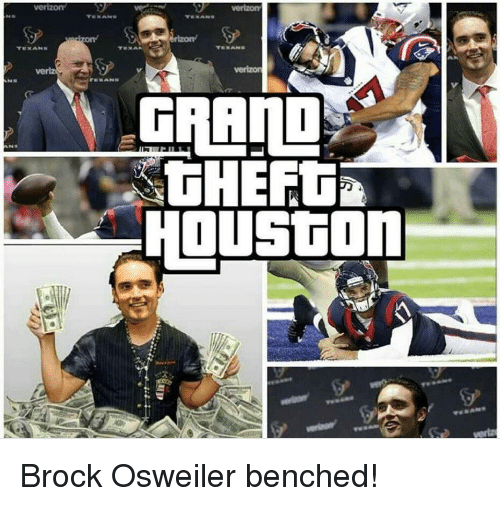 Good Brock Osweiler cut down on the overthrows and didn’t turn the ball over and the Texans offense actually had a few big plays. We know their defense is good (the best in the league, in fact, in terms of yards surrendered) and we know think they will be motivated to avenge that embarrassing September loss. I actually might take the Texans were they playing any other team than the Patriots. The problem is, the Patriots winning their divisional round game is about as sure a thing as a Donald Trump corruption scandal. They they’ve won their divisional game every year since 2011 by an average score of 38-22. In his 9539857134-year career in the NFL, Brady has lost at home in the playoffs a grand total of three times and since Houston’s quarterback isn’t Joe Flacco or Mark Sanchez, the Texans’ task feels daunting. Still, there are some minor vulnerabilities in this year’s Patriots squad – at least, on paper. Gronk is not in the lineup. They’ve played one of the NFL’s easiest schedules in 2016. The defense has had difficulties applying pressure to opposing QBs, and we all know how badly the offensive line played last year in Denver (where none other than Brock Osweiler beat them in Week 12). And whenever you’re going up against the league’s best defense – particularly in an era when great defenses are far less common than great offenses – it’s a potential cause for concern. But not the Texans – at least, not this particular Texans team without its best player (J.J. Watt), coming off a win against a quarterback playing in his first NFL game, going on the road to play against a team they haven’t beat since a meaningless (well, sort of meaningless) Week 17 game in 2009. In order to beat the Patriots, Houston has to unleash vertical threats deep downfield, which Osweiler – armed with DeAndre Hopkins and Will Fuller at his disposal – should be able to do. The reality, however, is different, and I don’t expect this game to be too different from September 22. Playoff Doppelganger: 2015 AFC Divisional Round, New England 27, Kansas City 20. The game was over five minutes in, when Brady marched the offense downfield for a touchdown without any difficulties whatsoever. The Chiefs scored a touchdown with a minute left in the fourth quarter to make the score appear deceptively close, but make no mistake about it, the Patriots are untouchable on Divisional Weekend. Sunday, January 15, 4:40pm EST, Fox. Roethlisberger (2004): 17/30, 181 yards, 1 TD, 2 Int. Flacco (2008): 11/22, 161 yards, 1 TD, 0 Int. Sanchez (2009): 12/23, 100 yards, 1 TD, 1 Int. For those of you at home keeping track, that’s 442 yards, 3 TDs, and 3 Ints . . . combined. That averages out to 13/25, 147 yards, 1 TD, and 1 Int. Does that sound like a reasonable Dak Prescott line to you? It’s actually a little low by Dak standards this season – in only two of his games did he throw for under 150 yards. It’s not unreasonable that he can reach that threshold vs. Green Bay. Chad Pennington (2004): 21/33, 182 yards, 0 TDs, 1 Int. Kerry Collins (2008): 26/42, 281 yards, 0 TDs, 1 Int. Philip Rivers (2009): 27/40, 298 yards, 1 TD, 2 Ints. 2004 Pittsburgh Steelers: 1st in scoring defense, 1st in fewest yards allowed. 2008 Baltimore Ravens: 3rd in scoring defense, 2nd in fewest yards allowed. 2009 New York Jets: 1st in scoring defense, 1st in fewest yards allowed. The 2016 Cowboys rank 5th in scoring defense and 14th in fewest yards allowed. Those numbers aren’t bad, but they aren’t elite like the three teams listed above. In addition, the Cowboys aren’t going up against Chad Pennington or Kerry Collins or Philip Rivers, but Aaron Rodgers, the greatest quarterback who’s ever lived (he’s pretty smart, too). You know, the guy whose only thrown 22 touchdowns and 0 interceptions since November 20. Earlier, I suggested that the Seahawks are 2016’s overreaction team because they looked so good last weekend. Why can’t the same be said of the Packers? After all, last week’s game was at home, Bad Eli showed up, and it was actually a close game until the fourth quarter. But the Giants are not the Lions, and Aaron Rodgers is a better road quarterback than Russell Wilson. He’s also 4-2 against the Cowboys all time as a starter, although strangely he has not faced them in Dallas since 2007. That last fact aside, I don’t think Rodgers will have much difficulty carving up the Cowboys defense. Of Rodgers’ six playoff games with a QB rating above 110, four came away from Lambeau, one came against the Cowboys two years ago, and the last one occurred last weekend. True, the Packers lost to the Cowboys in Week 6 and Rodgers posted merely “mortal” numbers (294 yards, 1 TD, 1 Int). But that was two months ago and Green Bay was a different team. Of course, the Cowboys have had a magical season with Dak and Zeke and the revamped defense. They played in a tough division and beat good teams (Green Bay, Pittsburgh, Baltimore). But since their Thanksgiving Day win against the Washington Football Team, the games have gotten closer and the offense has occasionally stalled. Look at these final scores: 31-26 over Washington, 17-15 over Minnesota, a 10-7 loss to the Giants, 26-20 over Tampa Bay, 42-21 over Detroit, and a meaningless 27-13 loss to Philadelphia. The 2007 Cowboys were kind of like this too; they fizzled out in December, and when everyone said to stop worrying, they promptly blew their divisional home game to Good Eli and the Giants. If you really believe Dallas can win this game, it isn’t about Dak or Zeke or Dez; it’s believing that the 26th ranked secondary can stop Aaron Rodgers and force him into turnovers (which Dallas ranks 19th at). The Cowboys are 13-0 when scoring 24 or more points, and 0-3 under 23 points; the Packers are 11-1 when allowing under 27 points. It’s possible that the Cowboys can score at least 24 points, but it seems impossible to believe their defense can hold Rodgers under 24. They aren’t exactly the Steelers or Ravens and the Packers aren’t exactly the Titans or Chargers. It’s a bad draw. Playoff Doppelganger: 2007 NFC Divisional Round, New York 21, Dallas 17. Adding to all the reasons above, Eli was in a similarly hot streak to Rodgers, having finished the season strong and coming off a good wild card performance. Unless Roger Goodell intervenes like he did in ’07, this week’s result should be no different. Pittsburgh Steelers at Kansas City Chiefs (Even). The hardest game of the week to predict (if you don’t believe me, just ask Vegas). The game has been moved back due to ice storms, which only makes it more difficult to forecast. Does the weather help Kansas City stall the Steelers’ red-hot offense? Or does the delay to Sunday night help calm down conditions and aid the Steelers? Most importantly, which Kansas City and Pittsburgh teams will show up? The Chiefs team with the league’s most explosive player, who took care of business in the AFC West and always seemed to find improbable ways to win? Or the Chiefs team that blew a double digit lead to the Titans at home and got blown out in Pittsburgh? Same question with the Steelers: the team whose (healthy) offense could not be contained, or the team that inexplicably lost by double digits to the Dolphins and Eagles? This matchup is a total contrast in styles. Kansas City is the run-first, punt-on-4th-and-1, conservative offense that wins games while scoring in the teens while Pittsburgh is the pass-happy, spectacular offense that is 12-1 when scoring over 24 points and 0-4 when scoring under 24 (try convincing me of those facts circa 2004). But here is one odd similarity: Pittsburgh hasn’t won a road game in the playoffs since January 2006, and Kansas City hasn’t won a home playoff game game since 1994 (their opponent? The Steelers). I’ll get straight to the point because the ice is scheduled to hit here soon and everyone is rushing to the grocery stores for booze, cigarettes, and barbeque sauce: I like the Chiefs in this game. A healthy Justin Houston and Tamba Ali is a wrecking crew that few offensive lines can handle; we know that when Roethlisberger is pressured, he forces errant throws. The Steelers’ most impressive road win this year was probably against the Bengals in Cincinnati (second place would be their Thanksgiving game against the Scott Tolzien-led Colts). The Chiefs are 12-2 in their last 14 home games, and when their fans are motivated, Arrowhead Stadium is the toughest place to play in the NFL. When Pittsburgh blew out Kansas City on October 2, Tyreek Hill had 24 yards receiving and -2 yards rushing; Travis Kelce had 23 yards. When those players aren’t utilized, the Kansas City offense becomes predictable, labored, and one-dimensional. If Kansas City trails by double-digits, they may be in trouble. And Pittsburgh won convincingly last week. But the weather, a healthy Houston and Ali, and the unstoppable force of Hill are the major reasons I lean toward the home team this Sunday night. Or maybe my admiration for this Chiefs team and my hatred of the Steelers is making me blind to Pittsburgh’s advantages (at least on the surface). In any event, the pick ‘em line is disrespectful and as long as Andy Reid doesn’t have to think about clock management, we should be fine. Playoff Doppelganger: 2001 AFC Divisional Round, New England 16, Oakland 13 (OT). Because why not – snow, classic AFC rivals, great coaches and quarterbacks. A controversial call, more snow, an amazing field goal, and an unlikely team that was made for the history books. Thoughts? Disagreements? Not enough Tom Brady enthusiasm (don’t expect it to return any time soon)? Let me know below.